Yes, we all agree they are magnificent creatures with beautiful big brown eyes… that is until you find they have been feasting upon your hostas while you slept! We have three safe options for you to keep Deer away. We carry Deer Netting which can be draped over your plants. Simply use a small stake (yep, we have them) around your bed and gently place the netting over your garden. 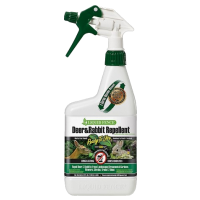 If your area is too large to net, consider using either Liquid Fence (Dave’s favorite deer repellent) or Deer Scram (we’ve been using it at Good Earth for years.) Both products are safe to use around plants, pets, and people. The key to these products working most effectively is applying as directed. Follow the suggested regimen and deer will no longer nibble on your plants. Liquid Fence is to be sprayed directly on plants. It only takes a few minutes and offers weeks of protection. Deer Scram is another all natural alternative Deer Deterrent. 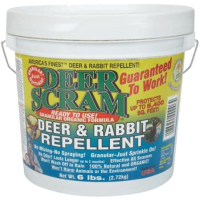 The Deer Scram company offers a 100% guarantee! Yep…not 98% or 99%…but 100% guarantee that your plants will be protected! It is very easy to use… sprinkle this granular product around your landscaped area. It will last for four weeks and does not need to be reapplied when it rains! Good Earth sells three sizes of Deer Scram….the handy shaker size (I always recommend saving the convenient shaker container) and we also have a 6-lb pail and a 25-lb bucket. Simply refill your shaker and walk around the area which needs protection in a zig-zag motion. By doing this, you are creating a barrier, which the Deer will choose to go elsewhere for their feast! We must reiterate….these products are most effective when used regularly!